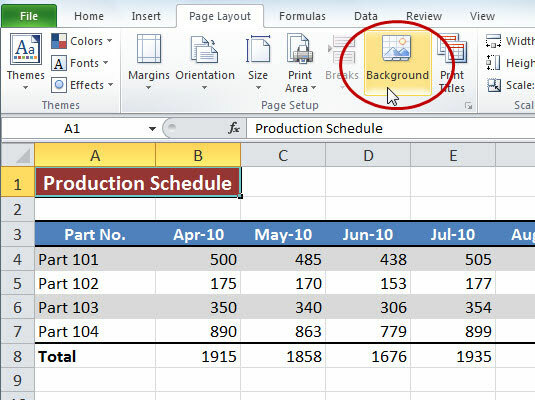 You can add a graphic image to the background of cells in an Excel 2010 worksheet. The background image (sometimes called a watermark) should be very light in color or use a greatly reduced opacity in order for your worksheet data to be read over the image. This feature can be quite effective if you have a special corporate watermark graphic that adds just a hint of a background without obscuring the data being presented in its cells. Keep in mind that an image that you assign as the worksheet background doesn’t appear in the printout, unlike pattern and background colors that you can assign to ranges of cells. Display the worksheet to which you want to assign a graphic in the background. You can apply a background image to just one sheet at a time. If you select multiple sheets, the Background button becomes unavailable. On the Page Layout tab, in the Page Setup group, click the Background button. The Sheet Background dialog box appears. This is where you select the graphic file for the worksheet background. Open the folder that contains the image you want to use, click its graphic file icon, and then click Insert. Excel closes the Sheet Background dialog box, and the image in the selected file becomes the background image in the current worksheet. To remove a background image, click the Delete Background button on the Page Layout tab of the Ribbon (which replaces the Background button when you assign a background image to a worksheet). Excel immediately clears the image from the entire worksheet.